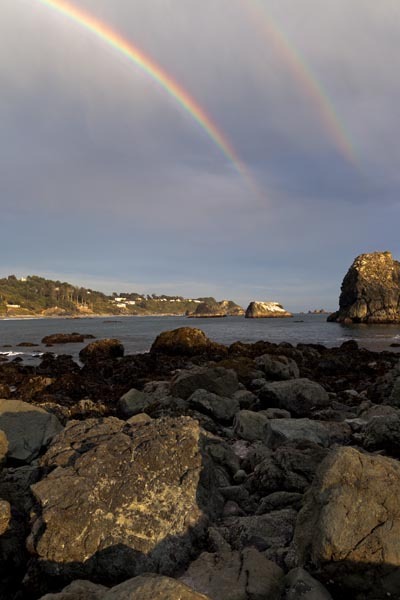 A double rainbow above the sea stacks along the Oregon Coast near Brookings, Oregon. This entry was posted on Thursday, August 29th, 2013 at 10:20 pm. It is filed under Landscape, New Images and tagged with brookings, coast, coastline, double rainbow, landscape, ocean, Oregon, oregon coast, pool, rain, rainbow, sea, sea shore, sea stack, seascape, seashore, seastack, southern oregon, tide, tidepool, water, Weather. You can follow any responses to this entry through the RSS 2.0 feed.